We are closing the week out on a relatively positive note in regards to economic data. This week's notable performances were the June Empire Manufacturing index reported at a far better than expected 19.3; a draw down in initial claims for jobless benefits, an increase in the Philadelphia Fed index, and a tick higher in Leading Indicators for the month of May. Naturally, comments made by Janet Yellen played a big part in giving investors confidence to buy stocks. Nonetheless, we wonder if we are near a point in which all of the good news is already out and accounted for in financial market pricing. With the equity market at lofty levels, it might take extraordinarily good news to keep the momentum moving higher. Next week has a busy calendar, so we'll soon find out if our assumption is true. The Treasury market is beginning to bore us. Not only does it refuse to pick a direction, but we are seeing declining option prices due to a lack of implied volatility. This type of environment offers little opportunity for position traders. Thus, we'll continue to refrain from doing, or saying, anything significant in this sector. We're playing the "same old tune"...we'd like to be bulls from better levels. Hopefully, we'll soon see some sort of technical flush to bring the ZB (30-year bond) to 134 or lower. On a side note, we've noticed that the "talking heads" have shifted from an overly bearish stance in Treasuries (bullish yields) to being largely bullish (bearish yields). This makes us slightly less bullish bonds and notes overall (we can't help it...we don't like being with the crowd). Nonetheless, we aren't convinced the bond bull is over just yet. **Consensus:** Position traders are likely getting whiplash. We'll wait for a clear signal. At risk of sounding like a broken record, the S&P futures tend to post a high at, near, or right after, expiration of the quarterly contracts. As expected, a short squeeze ensued this morning to peak out at the precise moment the June futures contract expired. We aren't entirely sure what causes this phenomenon, but we do know it is relatively reliable. Our guess is that it has something to do with the fact that most active speculators are short, while most investors and "buy and hold" speculators tend to be long. Thus, it is the bears (shorts) that are prone to the panicked liquidation. In any case, now that we are beyond the two events that tend to hold the S&P up (FOMC meetings and the quadruple witch), we might finally have a shot at giving the bears their time to shine. The chart is pointing toward a possible run to 1960 in the September ES contract (we aren't too far away), but this area should act as swift resistance. Aggressive bears might look to add on, or initiate, positions at that level. **Consensus:** The Fed rally and the OX rally are finally behind us. If the bears are going to make a move, it will need to be sooner rather than later. 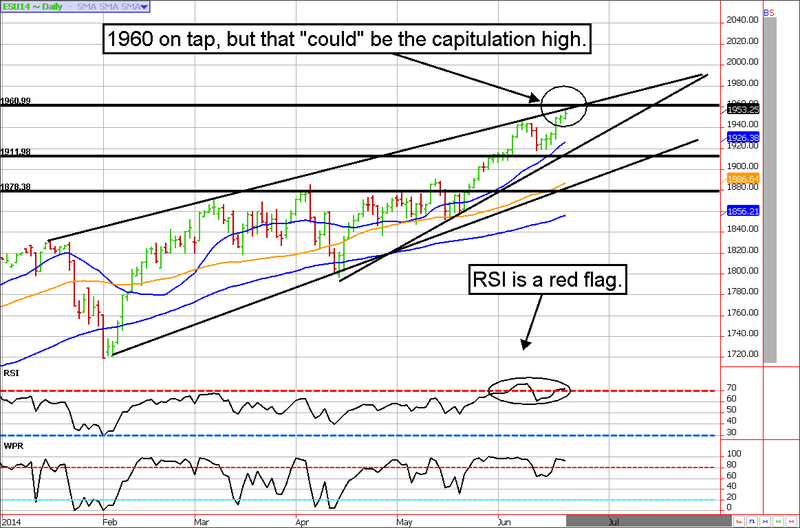 We are looking for a potential reversal near 1960ish in the September contract. April 25 - Buy e-micro gold futures near $1,270. 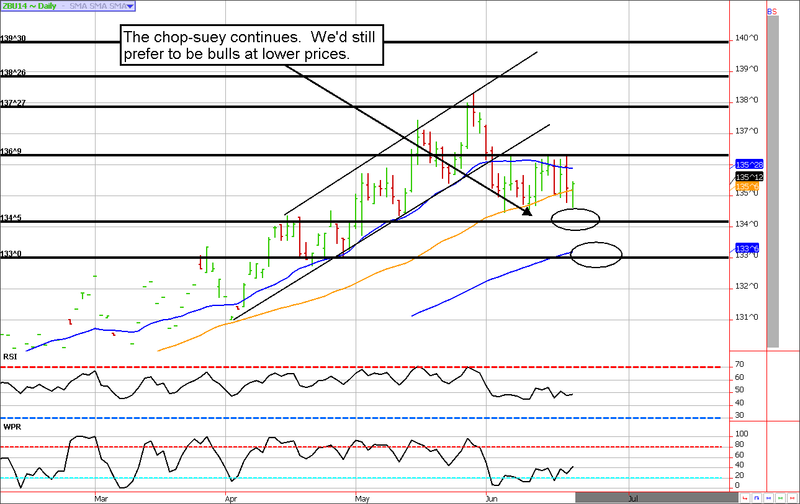 May 13 - Sell July Euro 134 puts for about 30 ticks ($375). May 28 - Roll June e-micro gold futures into August. June 2 - Buy back August 30-year bond 142 calls near 14 to lock in a quick profit of about $250 per contract before commission and fees. June 20 - Exit all long gold e-micros to lock in profits!! Many clients added into the dip in late May, profits for such clients ranged between $500 to $850 per one lot (two lots after add-on) before commission and fees depending on entry and exit prices.